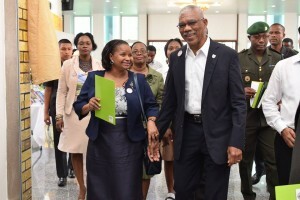 A local non-governmental organisation has taken to the streets in protest of Guyana’s Social Protection Minister Volda Lawrence and is calling for President David Granger replace her as the subject Minister. 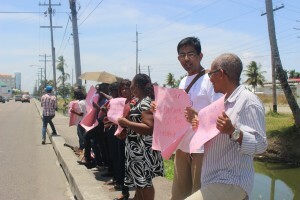 Red Thread on Friday picketed the Lamaha Street Office of Lawrence demanding that the Minister be disciplined for comments reportedly made in a case involving allegations of child sexual abuse. The Minister was at the time referring to allegations of sexual assault leveled against Winston Harding for whom the coalition has since pulled its support at LGE. Speaking to members of the media at the protest on Friday, Red Thread head Karen Desouza decried the Minister’s remarks. “I really don’t understand how the Minister of Social Protection who is also responsible for child care and protection could be saying in any possible way that child abuse and molestation is a family issue. The Sexual Offenses Act says that every single report of sexual abuse must be investigated,” said Desouza. She pointed out that here is some information to suggest that the Minister has been involved in various ways in this case and influencing the decision. “The police have a limited time to file charges or to refer the matter to the DPP and this has not happened. Now the Minister is saying this is a family issue and is trying to find ways to excuse the person accused,” she stated. The NGO’s head is convinced that the remarks should be enough for President Granger to unseat the Minister. DeSouza also opined that very little has happened in terms of policy movement on domestic violence, sexual offenses and child care since Lawrence has been Minister.